Guest post by Stephen H. Grant The Bard Will was born on the same day he died—and no one knows for sure on what day he was born. No birth certificate has been found for William Shakespeare. The closest thing is a baptism certificate dated April 26, 1564, in the parish register at Stratford-upon-Avon. 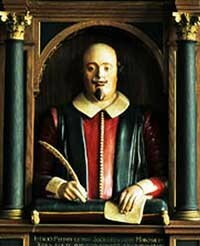 Shakespeare’s bust in the Holy Trinity Church states that he died on April 23, 1616, at the age of 53. Traditionally, then, April 23 is celebrated around the world as his birthday. On April 23, 1932, the English-speaking world celebrated Shakespeare’s 368th birthday in splendid fashion. The Prince of Wales flew from Windsor Castle to Stratford in a red monoplane. On the banks of the Avon River, he and the American ambassador Andrew W. Mellon spoke at the opening of the Shakespeare Memorial Theatre. American donors had raised nearly half the funds to construct the building, rebuilt after a fire; John D. Rockefeller Jr. was the largest American contributor, a fine irony considering that his father’s longtime factotum and executive employee, Henry Folger, had vigorously competed with Britons—Henry E. Huntington and others—to build a nonpareil Shakespeare collection. Mellon’s Shakespeare speech marked his first public foray beyond London. “We in America,” he intoned, “share with you a feeling of pride that England has given such a man to the world. He was of the heritage which we carried with us in founding a new civilization on the other side of the ocean, and his thoughts and the incomparable language in which he clothed them have become with us a part of our very being, as they are with you and all the English-speaking world.” On the other side of the Atlantic from Stratford, a newly confident American culture was about to receive an emblematic gift expressing its arrival as Europe’s equal in cultivation and respect for high culture. In Philadelphia, the University of Pennsylvania accepted a fine library assembled by the Henry Folgers’ close friend, Shakespeare scholar Horace Howard Furness. In Washington, Emily Jordan Folger—who had studied for her master’s degree under Furness—sat on the stage of the Elizabethan-inspired theater in the newly completed Folger Shakespeare Library on its dedication day. She wore a shoulder corsage of orchids and lilies of the valley over her Vassar academic robe. Choked with emotion, she spoke: “Shakespeare says for Mr. Folger and me, ‘I would you would accept of grace and love’ this key. It is the key to our hearts.” Her husband had died in 1930 without seeing one stone of the library or all his books assembled together. Turning our attention from 1564, 1616, and 1932 to 2014, Shakespeare’s 450th Birth Day in England will manifest a different array of celebrations, including: • Royal Shakespeare Co., Stratford-upon-Avon will perform Henry IV, Part 1. • Shakespeare’s Globe, London is playing Hamlet. • At the Shakespeare Birthplace Trust in Stratford-upon-Avon, the resident troupe of actors brings Shakespeare's complete works to life in just two hours. • The twenty-foot mechanical figure of Lady Godiva will be sleeping over on Henley Street in Stratford-upon-Avon, sharing stories and exploring the role of women in Shakespeare’s works. • London’s Victoria and Albert Museum will display the real human skull given to French actress Sarah Bernhardt by novelist Victor Hugo for her performance as Hamlet in 1899. Stephen H. Grant is the author of Collecting Shakespeare: The Story of Henry and Emily Folger. He is a senior fellow at the Association for Diplomatic Studies and Training and the author of Peter Strickland: New London Shipmaster, Boston Merchant, First Consul to Senegal. Reblogged this on wanderingbarkhumanities and commented: Happy early (maybe?) birthday to one of my greatest literary loves!